While numerous architectures exist for solving multidisciplinary design optimization (MDO) problems, there is currently no standard way of describing these architectures. In particular, a standard visual representation of the solution process would be particularly useful as a communication medium among practitioners and those new to the field. This paper presents the extended design structure matrix (XDSM), a new diagram for visualizing MDO processes. The diagram is based on extending the standard design structure matrix (DSM) to simultaneously show data dependency and process flow on a single diagram. Modifications include adding special components to define iterative processes, defining different line styles to show data and process connections independently, and adding a numbering scheme to define the order in which the components are executed. This paper describes the rules for constructing XDSMs along with many examples, including diagrams of several MDO architectures. Finally, this paper discusses potential applications of the XDSM in other areas of MDO and the future development of the diagrams. 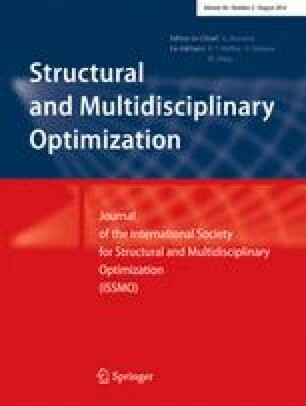 This work was presented by the authors under the title “A Unified Description of MDO Architectures” at the 9th World Congress on Structural and Multidisciplinary Optimization. This work was partially funded by a postgraduate scholarship from the Natural Sciences and Engineering Research Council of Canada. The authors would like to thank Justin Gray and Kenneth Moore of the OpenMDAO development team at NASA Glenn Research Center for their feedback on the diagram structure and notations, as well for their help in verifying the XDSMs for the various MDO architectures. Their suggestions substantially enhanced the quality of the final diagrams. Additional suggestions were provided by Evin Cramer, William Crossley, John Dannenhofer, Raphael Haftka, Robert Haimes, Michael Kokkolaras, and Sean Torrez. Finally, we thank one of the anonymous referees, whose comments helped us properly place our work in relation to some of the MDO literature cited herein.